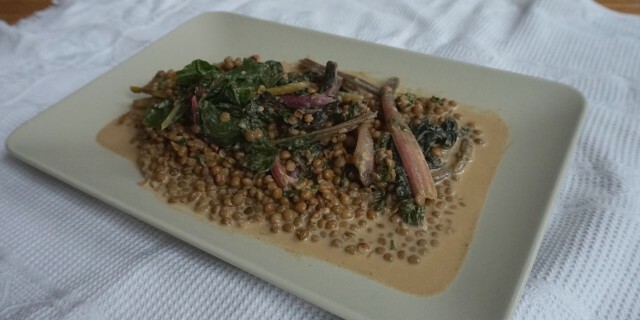 This Lemon Tahini Rainbow Chard with brown lentils is a lovely, light yet satisfying dish. I like to serve it with tabouleh or spelt couscous. The first time I ate sautéed rainbow chard was at Nopi, Ottolenghi’s restaurant in Soho, London. I have been making sautéed chard ever since. Rainbow chard is quick and easy to prepare. The wilted greens have a slightly bitter and earthy taste. The sweet and salty Lemon Tahini Sauce complements the chard very well. You can easily substitute the rainbow chard with Swiss chard or spinach depending on what’s available in your local store. In a small bowl, whisk together all the ingredients for the lemon tahini sauce. Heat olive oil in large sauce pan at medium heat. Add the rainbow chard. Sauté for 5 minutes or until the leaves are soft but the brightly-coloured stems are still crispy. Add the brown lentils and lemon tahini sauce. Mix well and sauté for 1-2 more minutes or until most of the liquid has evaporated. Serve Lemon Tahini Rainbow Chard with tabouleh or couscous.